We know the ten countries that qualified out of Eurovision Semi Final 1 (with the Top 6 countries in this semi-final accounting for six of the countries that finished in the Top 7!) but would the result have been different if it had been solely based on a jury vote or solely based on the televote/jury vote? Who are countries likely to give the big points to in tonight’s Final? The table below presents the most likely suspects for each of the countries voting tonight in the order that they have been scheduled to present their votes tonight, based on these countries’ patterns of Eurovision Song Contest voting since the introduction of televoting in 1998. This analysis just looks at voting patterns for the 26 countries taking part in tonight’s final and it must be noted that some of the countries listed below would traditionally give higher points levels to other countries that may have been eliminated this year at the semi-final stage (such as the three Baltic states or countries such as Moldova, Georgia or Ireland) or to countries that are not taking part in this year’s contest (such as Turkey, Serbia, Bosnia and Herzegovina, Croatia). Diaspora votes that may usually have gone to Turkey may go instead to Azerbaijan (as seems to have happened at the 2011 Final and the 2013 contest), while Montenegro and Slovenia may well be the beneficiaries of support from the Serbian, Croatian and Bosnian diasporas. A full outline of the usual voting patterns of all these countries (including losing semi-finalists in this year’s contest and countries that did not take part in 2014) may be viewed in The 2014 Eurovision Handbook, which is still available in e-book format at the price of €4.99 with all profits (if any!) from this going to the Irish Cancer Society. 2014 Eurovision Final results estimate: Undo the journey from Malmo to Copenhagen? As I used this model to successfully predict the Azerbaijan win at the 2011 contest and Denmark win in 2013, now that we know the running order for the 2014 Eurovision Final I am going to use this to tease out who the likely winners will be of the 2014 contest will be. With the numbers crunched, Sweden – who were second favourites before the contest but after the semi finals have been vying with Austria for the contest favourites position – sit on the top of the pile. If Sweden does not win, the figures suggest that Greece, Armenia, Ukraine and The Netherlands would be then very much in the mix to take the ultimate honours, with Denmark, Azerbaijan and Austria also vying for strong finishes. But be wary. This model cannot take account of actual performances on Final night, nor can it account for the voting decisions of the highly influential professional juries, who have as much bearing on the result as the televotes have. 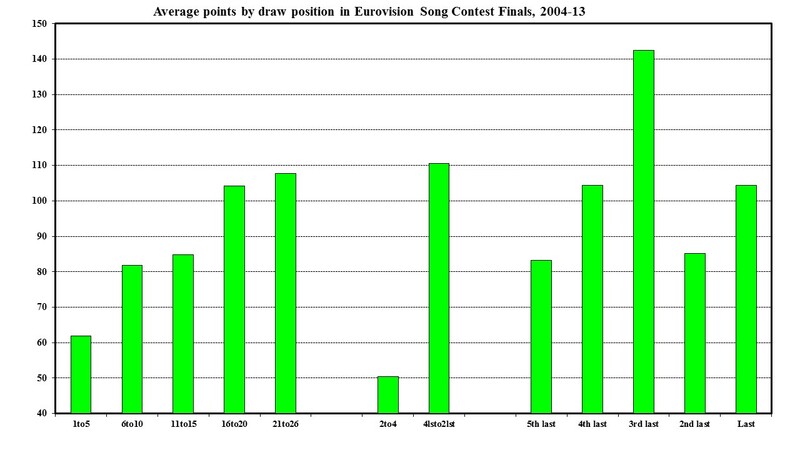 As discussed in The Eurovision Handbook 2014, and as also detailed on some of the posts on this site, the position a song is performed in at a Eurovision final and semi-final can have a bearing on that song’s prospects, with the general rule of thumb being that a latter performance position is the most advantageous.